Stinsford is a village and civil parish in southwest Dorset, England, one mile east of Dorchester. The parish includes the settlements of Higher and Lower Bockhampton. The name Stinsford may derive from stynt, Old English for a limited area of pasture. In the 2011 census the parish had a population of 334. The parish has five large country houses - Birkin House, Frome House, Kingston Maurward House, the Elizabethan Old Manor House and Stinsford House. Much of the land in the parish is occupied by Kingston Maurward College, a further education college. There has been worship at the site since at least Norman times, but the only remaining parts of the earliest structure are the sculpture of St Michael, inside the west wall of the south aisle, and the restored Purbeck Marble font. St Michael's was the local church of novelist and poet Thomas Hardy and he was baptised here. Stinsford is the original 'Mellstock' of Hardy's novels Under the Greenwood Tree and Jude the Obscure. Hardy's heart was buried in the churchyard in 1928, alongside the grave of his first wife, Emma Lavinia Gifford, who died in 1912 and his second wife, Florence Dugdale, who died in 1937. The churchyard also contains the grave of Poet Laureate Cecil Day-Lewis, who died in 1972 and had arranged for his burial to be close to Hardy whom he admired. Also here are the remains of the actor and dramatist William O'Brien and his wife Lady Susan Fox-Strangways. Stinsford has a six-a-side football team which plays in the Dorset six-a-side leagues. The team is noted for its luminous orange strip and has provided players who have later moved on to play for football teams such as Yeovil Town F.C. 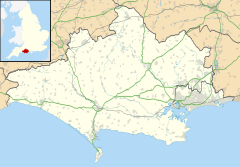 ^ a b "Area: Stinsford (Parish), Key Figures for 2011 Census: Key Statistics". Neighbourhood Statistics. Office for National Statistics. Retrieved 22 April 2014. ^ Roland Gant (1980). Dorset Villages. Robert Hale Ltd. p. 173. ISBN 0 7091 8135 3. ^ "Stinsford". opcdorset.org. 2013. Retrieved 19 December 2013. ^ "St Michael's, Stinsford". achurchnearyou.com. 2010. Retrieved 19 December 2013. ^ "St Michael's Church, Stinsford". coolplaces.co.uk. Retrieved 19 December 2013. ^ Liukkonen, Petri. "Cecil Day-Lewis". Books and Writers (kirjasto.sci.fi). Finland: Kuusankoski Public Library. Archived from the original on 27 July 2014. ^ Hyams, John (1970). Dorset. B T Batsford Ltd. pp. 156–7. ISBN 0-7134-0066-8. Wikimedia Commons has media related to Stinsford.